"It’s set up a bit like university; they give you the resources and tell you what to look at, tell you what you need to know to pass an assignment, and let you get on with it." A chance remark from his grandmother in Hong Kong gave Derby teenager Joyin Li the idea of becoming a building surveyor. Derby College is now giving the nineteen-year-old Professional Construction student the skills and access to work experience to follow his dream. As a boy Joyin enjoyed watching flats being built on his grandparents’ land when his family visited them in Hong Kong. His grandmother commented that there was good money in building surveying…and her words stuck. 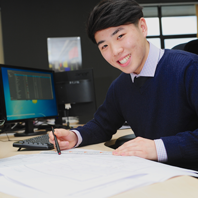 Now he is studying Level 3 Professional Construction while enjoying work experience two days a week with Pride Park-based architecture and construction consultancy YMD Boon. The consultancy is a member of Derby College’s Employment and Skills Academy (ESA), which aims to nurture students as they move from education to employment. Joyin said: “I’m enjoying the course. It’s set up a bit like university; they give you the resources and tell you what to look at, tell you what you need to know to pass an assignment, and let you get on with it. It will give you skills to progress at university. Joyin gained a triple distinction in year one and is currently studying in year two. Now he has targeted a place at Nottingham Trent University. He originally completed a Mechanical and Electrical BTEC Level 2 at Derby College before taking Professional Construction on the recommendation of a lecturer and fellow student.